Where does your baby sleep? One thing is for sure, though; your child has to be near you. In fact, your little munchkin should be within arm's reach. A lot of parents though have debated on how near your child should be - within the room, sharing the bed with them or co-sleep. Some find it convenient while others see it a hassle. You, however, have found yourself awake and taking care of your child all night long. You start to wonder if finding the best co-sleeper, bed share or room share styles will work wonders for you and your kid. If you're confused, we might be of help to you. Choose - Room Share, Bed Share Or Co-sleep? Finding where the best spot for your baby to sleep is tricky. When you were pregnant with him, you have imagined yourself together being near all the time. However, now that he's out of your tummy, you start panicking if whether you'll suffocate him! Will you buy a crib, share a bed or keep him close by with a co-sleep? What's the difference? Co-sleep. Your baby sleeps next to you in a crib. Within just one reach, you can interact with your child and answer his needs in a jiffy. You still have to get up but not too much and not too far when checking your baby or breastfeeding him. Room sharing. Though you can say that a co-sleep is the same with room sharing, there's a slight difference when it comes to space. Room sharing could also mean that the baby is not next to you but just somewhere within the room area. Bed sharing. This is when parents and their baby sleep together on the bed. Though it has a lot of advantages, it is a much debatable concern. 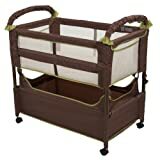 With lots of discussions and opinions taken, we decided that a co-sleep would be best for a child. Having your baby in a bedside cot has perks and boo-boos as well. See if your co-sleep closeness will bring the two of you safety and happiness. We’ll get to understand why it’s advantageous for a baby to sleep next to you and why it is not. Closeness makes baby feel safer and the mom more comfortable. Encourages a more convenient breastfeeding technique. Mothers can regulate her sleeping cycle as well as her child’s. Quick response time for the mother to soothe their baby’s needs. Improve mother and child relationship at an early stage. Highly depending on the co-sleep, and how parents see to their child, the disadvantages we see are more in the hands-on activity of parents. 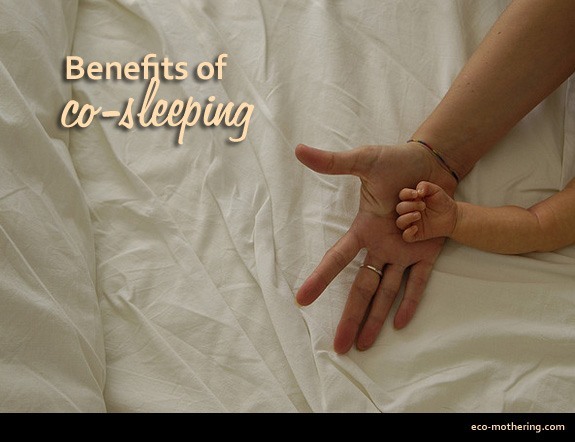 Only children of four months and older are allowed in co-sleeping. Too much frou-frou in bed with a baby would significantly increase sudden infant death syndrome (SIDS). A premature or low-birth-weight baby has to avoid co-sleeping practices. A crying and wriggling baby will annoy you, especially now that your kid is near you. Baby will get to be too attached to your presence. A co-sleep is one baby item you should consider buying. There are a lot of co-sleeps out there, and each one has a different feature. 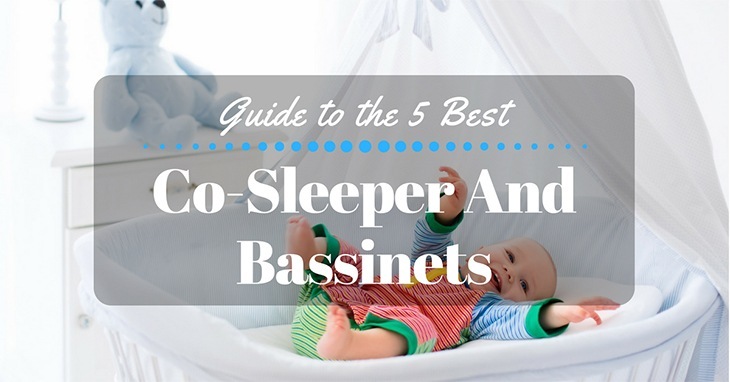 You have to understand your needs and your baby’s to select the best co-sleeper out there. This guide on what features to look for will help you find what you need so you can rest easy. Avoid a wobbling and rattling co-sleeper. Shake the crib if whether it moves unsteadily. If it does, find another one. A wobbly co-sleeper will critically injure your baby. Check the frames, whether they’re made of wood, plastic or metal, for any deficiency in its quality. The mattress﻿﻿﻿﻿﻿﻿﻿ is equally important in looking for a co-sleeper. Not only it’s for the baby’s comfort, but it’s or her safety as well. An improper mattress can hurt your child. For example, if the crib is too big and its bed is a bit smaller than expected, your child will injure its head and neck once his head is pressed on the railings. Look for a mattress that supports your baby’s weight. A proper thickness will take you three to six inches. Too soft can suffocate your child. Check if it has a proper elevation and whether is breathable. Spatial distribution is necessary for particular between the railings and mattress. Don’t you know a baby can get stuck or trapped in the area where there is free space? Some can cut off their air support thus suffocating the baby gravely. High elevation is perfect for children of four months or more. But if you’ve noticed your child is growing rapidly and becoming more active, adjust the height. It’ll cause problems if your child falls from his crib or if he gets out of his crib on his own. We’ve seen tons of videos of babies trying to break out from their cribs. Some parents would want their co-sleeper to be portable as much they want it. A folded co-sleeper would be a great option for parents for ease of storage when it’s not wanted at the moment or later on. Found the features you want for the best co-sleeper you’re eyeing to buy? If you have any defects, call and report it to the Consumer Product Safety Commission (CPSC), at www.﻿﻿cpsc.gov. The CPSC has reported many cases of child injuries on which cribs or co-sleepers are the main culprits. Check for splinters, rough edges, nails and other hazardous items sticking out of the crib. Paint shouldn’t be peeled. There are chances where your child will consume them. Moreover, never place too many pillows, stuffed toys, and thick comforters. It will cause SIDS. Clothing your baby too much will overheat him too. This co-sleeper rotates 360 degrees for ease of turning your baby towards you. Its side walls lower with ease and can be locked in position. It has a 4-point base adjustment to fit most bedding. Made from polyester which makes it waterproof, HALO cushion sheets are also machine washable. Also, it has two pockets for parents to keep baby’s valuables. 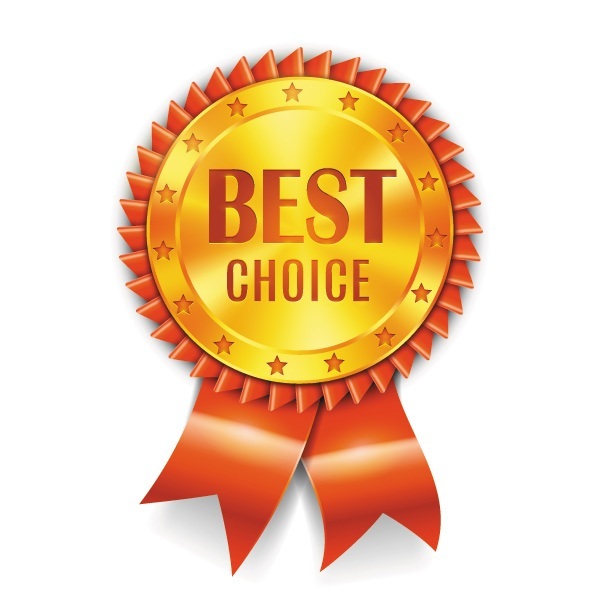 What’s more, it has been tested by the U.S. Consumer Products Safety Commission and Health Canada safety standards. The spring side wall works well. Baby access is easy, convenient and safer. Swivel motion is good and doesn’t disturb the baby. Extra accessories include music, vibration, and lights which are fun. Helpful for mothers who have a hard time getting up or had c-section. The nursing vibration has a timer. Mattress is not waterproof and is hard to wash and air dry. Takes too much space in the house. Portability is impossible since the bassinet is massive. The mattress, though it’s thick, is hard and uncomfortable to the baby. The swivel doesn’t lock if you want to keep it fixed in a particular position. Poor adjustability of the mattress height. Does not come with mattress – a hassle for parents. The SwaddleMe is made from polyester and has a detachable sound, light, and vibration that play heartbeat, nature sounds, and music. Side walls make it easier for the air to circulate and protect baby from overheating. The co-sleeper is foldable and made of metal frames. It’s easy to carry around and works well in storing. Helps babies sleep better as parents found SwadleMe a little more comfortable. The pad’s material can easily be wiped. 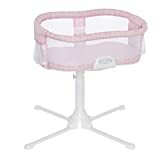 The mesh of the side walls makes the co-sleeper more breathable for the baby. The mattress material is thick and breathable. Comes with an automatic timer. The mattress has crinkly sounds that bother the parents and babies. Parents report that it is quite difficult to fold back. Just be careful. Some SwaddleMe comes with a high chemical odor. The size is too big, and most parents have a hard time sleeping with it on the bed. The bottom is not supported by anything hard and relies only on the hardness of the bed. It wobbles side to side. 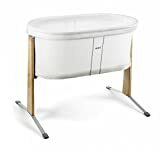 Arm’s Reach has a storage basket and a 360-view of the baby. It also comes with a mattress fitted sheet strap and plate. This co-sleeper also has wheels on it. There are leg extensions to adjust to varying bed heights as well. Adjustability features are great given that a press a button on the leg to have it up and down. Easy to assemble and disassemble. Portability is good as you can wheel it anywhere. It’s roomy for the baby. Suitable for kids who does a lot of twists and turns. The lower side provides the mother with ease to care for the child. A space full of storage provides a significant help for storing baby’s needs. It’s light for people who wanted to transport it to a particular location. It’s a bit unstable. Thus, it rattles. It has a crunchy noise when the baby moves. It has gaps between the mattress and bed frames. The wheels are a bit flimsy to move around. Poor quality of the mattress. The straps that fit under the cushion to keep the co-sleeper stable sometimes slips away. The crib has a gentle rocking movement. Baby Bjorn is low in height and has a transparent mesh material for an easy glance upon the baby. It is made of soft, breathable and airy materials with basic designs. Gentle rocking provides a great way to put the baby to sleep. While some co-sleeper mattresses have no support underneath, Baby Bjorn has. It is lightweight and easy to carry around. Breathable sides and support bottom are key features for the baby. Canopy accessory is quite helpful to fend off bugs and other insects. The mattress cushion is easy to wipe and clean. The co-sleeper is too low for some parents. The rocking only works when your baby is only a couple of months old. They outgrow the rocking. Safety labels are sewn into the fabric of the side walls of the co-sleeper. Parents make a fuss with the material of what the mattress is made off. The mattress seems hard and makes baby uncomfortable. Does not hold enough support for active children. Too short for infants. Not enough room. Another Arm’s Reach products, it has four breathable mesh sides and comes with a mattress, sheet, and a bag. The storage area has a lot of space. Useful for placing baby items. It’s pretty light and easy to carry around. It’s a space saver around the house. Leg extension kit is useful for those with higher beds. The mattress is thick and firm for babies. Perfect for travel as it provides little hassle. Is compatible with other natural or organic mattresses. The mattress seems a bit too firm and makes babies uncomfortable. The co-sleeper is a bit small, as it is a space saver. Consider buying another sheet for baby’s comfort. Assembling and disassembling was proven to be difficult. The sides of Arm’s Reach are a bit difficult to lower. 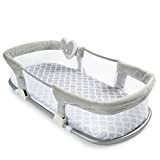 And the best co-sleeper we’ve found is the HALO ﻿﻿Premiere Series Swivel 360 degree Sleeper Bassinest. Lowering the sides is easy, making it more efficient for mothers to see to the needs of their children. Though the swivel does not lock, babies are not bothered by its motion. Even though it’s relatively heavy and quite hard to transfer from one place to the other, it’s quite sturdy and stable - features that make up for the flaws. The extras, which are the co- sleeper's music, vibration and lights seem exciting, though a lot of parents would want it not to have a timer. Though having a timer would save batteries. It’s a mixed review.So, there you go. The parents have spoken, we have shared our part, and you know what the best co-sleeper is. Better if you would buy one today. Just tell us how and we’re glad to help you out. Hi, I'm Sarah Clark. I like to write about mommies and their babies. Sometimes, even if I don’t, I like to hear stories from other mothers. I may not be an expert mommy by any means, but I am happy to share what works for mothers out there. I, for once, would like to build a community for mothers. And that's here in Giant Mommy. GiantMommy.com is a participant in the Amazon Services LLC Associates Program, an affiliate advertising program designed to provide a means for sites to earn advertising fees by advertising and linking to Amazon.com. Additionally, GiantMommy.com participates in various other affiliate programs, and we sometimes get a commission through purchases made through our links. Copyright text 2017 by GiantMommy!